Did you know you can now order your Deliveroo takeaway from Gogi here on View? 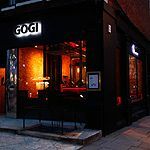 Gogi is an impressive Korean bar and grill offering a fine selection of authentic Korean dishes from an attractive setting in Little Venice. Do you work at Gogi? What did you think of Gogi? 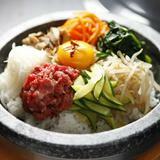 A seductive little Korean bar and grill on the Edgware Road serving excellent food with commitment and panache. Gogi opened its doors in January of this year. And amidst the culinary bonanza that is the Edgware Road, this place had a lot to live up to - thankfully it does. As a restaurant standing alone, it draws attention from the passing traffic but due to the affluent residential area by which it is surrounded, it also retains that local, neighbourhood feel. 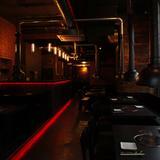 The restaurant is intelligently lit, in that it manages to create a real air of anticipation to dine there. The tables are dark and the exposed brickwork and faux-industrial piping on the ceiling are dramatic features but they strike a lovely balance with the warm orange hue of the place. The members of staff are more than competent, and this is most obvious when they assist you in cooking on your individual barbecue built into the table. The menu is vast, but very easy to navigate if you know what floats your boat. A wonderful - and recommended - way to begin is with the modum kimchi (pickled spicy cabbage, cucumber and radish) and the modum namul (spinach, radish, courgette and mushroom with sesame oil and garlic) - £6 each. Salmon hwe (£9.50) comprises thick slices of raw salmon topped with hot Korean chilli sauce, and is silky perfection. The traditional Korean pancake, pa jeon (£8.90), is similarly impressive, and full to the brim with prawns, mussels, squid, nostalgic-yet-divisive crab sticks, and heaps of spring onion. It seems a shame not to christen the grill sheepishly positioned between you and your dining partner, so for some surf and turf try pairing the scallops (£12.50) and rib eye steak (£13.50): the former are plump and brought to the table in their ostentatious shells; the latter thinly sliced with glistening marbled fat running through. The staff will begin the cooking and seasoning process, whilst also teaching you how to properly eat Korean barbecue (in this case dipping the meat in the sesame oil and salt, then wrapping in lettuce and topping with spicy spring onion and the ssamjang paste). It's a spectacle, an activity and an utter pleasure to eat. As is the yukgaejang (£9.50), a spicy bubbling bowl of noodles, beef, chilli and plenty of black pepper. It's a hearty classic that warms the soul and proves the competence in the kitchen. A cherry yoghurt torte (£4.50), although not quite typically Korean, is fresh, delicate and a naughty end to a marvellous meal. A bottle of perfectly dry and fruity Sauvignon Blanc is £19.50, large bottles of sparkling water are £2.50 and authentic cast iron teapots of camomile citrus or green tea (£2.50) are a neat touch. A sophisticated gem of a restaurant that has its finger firmly on the (chilli-induced racing) pulse.